I felt tired and uncomfortable and nothing medical was found even though I consulted with numerous doctors and tried a lot of alternative therapies. 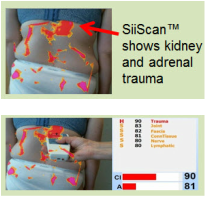 SiiScan showed stress in my kidney area. It was near where I had fractured my back in a bad accident. Turned out that my kidney and adrenal gland were shifted by the trauma and were very irritated. Access gently freed everything up. My energy is much better and I feel “right” now. Chronic dislocating shoulder due to old sports trauma, persistent tension, and stiff tissue status in the lung and pleura.